New York- I picked up the American printing of James Brabazon’s My Friend the Mercenary which details his adventures in the early to mid-aughts in West Africa and his Afrikaner mercenary pal who wound up on the wrong side of the failed Wonga coup in Obiang’s Equatorial Guinea in 2004. I read nearly a third of this book as soon as I got it. Fun stuff. I was a bit on the fence about picking it up because the photos are by the late Tim Hetherington and I thought that might be a bit sad (I saw his book, Infidel, while I was rooting around the same Barnes & Noble) but this book is kind of uplifting in an odd sort of way. Perhaps the fact that I can identify with the central character, Brabazon himself, having endured my fair share of sketch in the global Balkans during those heady days of the Bush years (Pankisi Gorge comes to mind-thanks Colin Powell). I have an article out in this week’s edition of Terrorism Monitor pictured et linked here. 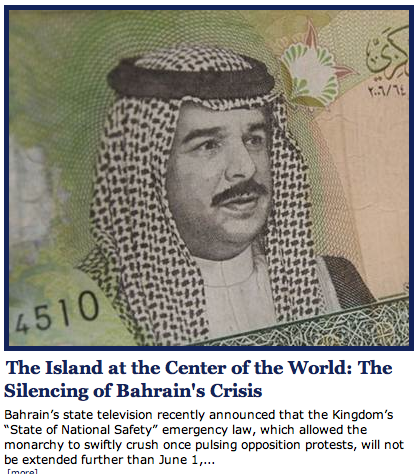 I was noting with a friend last week just how much Bahrain has fallen off the front page–a combination of that government’s efforts to keep people like myself out and the sheer volume of globe rocking events occurring–a no sooner than I put something out that it pops back on CNN International, PBS Newshour, and Al Jazeera English. Strange how the world seems to work that way some times. Libya continues to burn and Syria is showing no signs of letting up. The Times of London’s Martin Fletcher managed, I think somewhat foolishly, to get into Syria on a tourist visa. That was a serious risk considering what had happened to an Al Jazeera reporter there. Now Pakistan is back in vogue as some interest in the Arab Spring begins to recede. And then of course there is the never-ending story of poor Afghanistan. The is more going on these days than even I can keep up with as a serious news junkie. Time to baton down the hatches.